This article is the second installment of a Street Roots investigation into the impact of criminal and traffic-related fines and fees on low-income Oregonians. Desperate to make the cut, a handful of people camped out on the sidewalk overnight. Dozens more joined the line before sunrise. When East Portland’s Rosewood Initiative opened its doors at 9 a.m., staff quickly signed up the 135 people it could serve that Friday afternoon in October. And then it signed up 125 to 130 more, filling up the list for its next event before being forced to turn people away. Every two months in Multnomah County, low-income residents with unresolved legal matters can seek relief at these events, called Legal Services Days, if they show up early enough. The long line that morning was filled with people hoping to get out from under court debts that many told Street Roots they felt had become so large that they were difficult to pay off. Almost everyone was seeking a reduction or waiver of their criminal- and traffic-related fines and fees to clear the way for getting their driver’s licenses back or so they could expunge old convictions from their record. In many cases, hundreds of dollars in additional fees, interest and other assessments had been tacked onto the debtors’ bills as they sat uncollected. Under state statute, county circuit courts in Oregon must charge an additional $50 to $200 just to set up a payment plan. If payments are missed and that debt goes to the Oregon Department of Revenue for collections, an additional 28 percent of the balance owed is added to the bill. Should it go to a third-party collections agency, it woud begin to accrue interest at a rate of 9 percent. Debts can easily double before they’re ever sent to collections because setting up a payment plan alone can increase the amount owed by as much as 128 percent. Municipal courts often have their own schedules of additional fees and surcharges, and among many Oregon courts, debtors are required to pay off traffic tickets within 12 months. This can make some payment plans unaffordable to low-income defendants. Suffering from initial sticker shock and not seeing a reasonable path toward settling their debts or missing a monthly payment and becoming frustrated with the fees is how some people say they wound up at Legal Services Day. Prosecutors, public defenders and judges staff these events on a volunteer basis, allowing defendants to exchange eligible debts for community service or voluntary alcohol and drug treatment hours at a rate of 1 hour per $100 of debt. They can exchange up to 80 hours. After that, any remaining eligible balance can also be forgiven. Restitution and select fines and fees are ineligible for relief. To get the slate wiped clean, participants must swear before a judge that financial hardship has prevented them from paying their debts and provide an official letter showing how many hours of treatment or volunteer work they’ve completed. Those who spoke to Street Roots said they were motivated to settle their debts because, in many instances, their outstanding bills and the resulting consequences had kept them from accessing housing and employment and from being able to drive legally. “I was denied housing seven times,” said Craig Ali, a 53-year-old African-American man with multiple sclerosis. He and his daughter were homeless for many years, he said, and his criminal record often stood in the way of getting a roof over their heads. Because he still owed court-related debts on a couple of 17-year-old felonies, he was not eligible for expungement. He said this also resulted in at least a dozen employment denials. “They even denied me at Goodwill,” he said. Single mother Natasha Rea came to Legal Services Day with two of her three kids in tow. She’s earned a peer support certificate and wants to work as recovery mentor, but she can’t travel as needed without her driver’s license. She said the source of her debt is all traffic related, beginning with fines for expired tags and speeding tickets she was issued seven years ago, which she couldn’t afford to pay. Nonpayment led to her license being suspended, and then she was ticketed for driving on a suspended license. She was ecstatic that she was able to get relief for the $6,500 she owed to Multnomah County. Some debtors had paid significant amounts on their bills, such as Brittany Morris, a 27-year-old single mother who works as a cashier. She’s paid the state close to $25,000 over the past 10 years on two DUIIs and multiple traffic violations, she said. Her 10-hour work shifts begins at 5 a.m., but she needs to take her daughter to school on her break at 9 a.m., which led to a misdemeanor charge for driving on a suspended license. After nine years of suspension, she got her license back in December through the Department of Revenue’s reinstatement program, which allows debtors to regain their driving privileges after making a deposit followed by monthly payments. Morris had come to Legal Services Day to get some relief from the $5,160 she still owed the courts. She said she’s had to make a lot of sacrifices to make payments her debts over the years, including going without health insurance and spending less on necessities such as food and clothing. After serving a four-year prison sentence for marijuana- and gun-related charges, C.J. heard about the event through his halfway house. It’s unlikely the 53-year-old gas station attendant would ever have been able to pay off such a large debt. 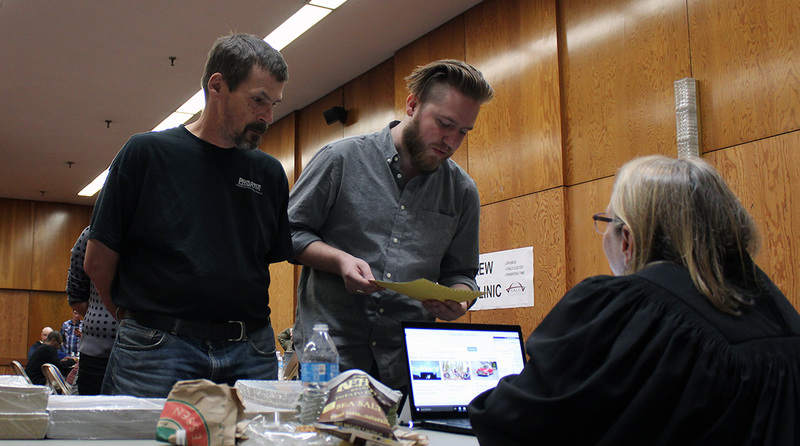 Several attendees told Street Roots that their court- and traffic-related fines and fees stacked up when they were in the throes of addiction, and now that they were in recovery, large legal bills stood in the way of becoming fully functioning members of society. A similar legal clinic was organized as part of the annual Veterans Stand Down event at the Portland Convention Center in September. There, veterans pledged to do community service in exchange for a reduction in fines, but unlike at Legal Services Day, there was no requirement they prove the hours were ever completed. Judge Beth Allen forgives Donald Sinclair’s fines at Veterans Stand Down on Sept. 11, 2018. Public defender Maxwell Evans (center) assisted Sinclair (left) through the process. Curtis Tice, who shuffled in with a walker, said he planned to volunteer at his church to pay off his debt. He owes $1,600 on two traffic cases that are more than eight years old. He said it’s hard for him to get around on public transportation with his disabilities, and he hopes to get his license back. From these and other interviews Street Roots conducted, a pattern emerged: Most seeking relief were poor when fines were imposed upon them, and they were charged additional fees and suffered consequences as a result of their inability to pay their fines in full. And while Legal Services Day is slowly expanding, erasing fines that would likely never be paid, courts across the state continue to levy court debts on people in poverty, who then continue to suffer the consequences. Lisa Foster began examining fines and fees in America’s criminal justice system while serving as an office director at the U.S. Department of Justice under the Obama administration. When a report came out on Ferguson, Mo., in the wake of Michael Brown’s shooting, it revealed how that city’s court was imposing stiff fines and then using coercive practices, such as jailing debtors, to extract payments. After leaving the Department of Justice, Foster kept coming back to the issue of fines and fees; it kept her up at night, she said. So in April, she launched the Fines and Fees Justice Center in Washington, D.C., where she and her co-director, Joanna Weiss, have begun their team’s reform work by focusing on pilot projects in New York and Florida. They’ve already had one big win in New York City, where they were part of a coalition that persuaded City Council to eliminate fees for phone calls made from jail. Fines have always been a part of the criminal justice system, Foster said, but they used to be much smaller and imposed as an alternative to jail for minor crimes – not in addition to lengthy prison sentences as they commonly are today. The additional fees that get tacked onto fines are a modern-day phenomenon altogether, she said. “The increase in fees, both in the number of fees imposed and the amount of fees, has really been within the last 30 years, and it has coincided with mass incarceration,” Foster said. The onset of mass incarceration meant increased costs to the justice system, including court costs, all while the no-new-taxes movement was taking hold in the late 1980s. But Foster takes issue with funding the criminal justice system through the imposition of these user fees. Another relatively new Washington, D.C.-based organization tackling fines and fees is Civil Rights Corps. It’s been challenging the United States’ bail system through lawsuits against jurisdictions across the country, and it has taken aim at predatory diversion-program fees and the practice of suspending driver's licenses for nonpayment of traffic fines. All the policies it’s targeting for reform – from pretrial to probation – explained Civil Rights Corps attorney Tara Mikkilineni, go against the same fundamental discrimination principle that the Supreme Court, long ago, pointed to in determining that debtors’ prisons were unconstitutional. That principle says you can’t punish people for being in poverty. Before the Ferguson report began bringing fines and fees issues to light in 2015, they largely flew under the radar. After convening stakeholder conversations in the nation’s capital, Foster sent out a letter to every state’s chief justice and state court administrator, highlighting seven common but unconstitutional practices related to collecting fines and fees. She also initiated a grant program for states willing to reform their practices. Since then, fines and fees reform has gained traction in some areas. While California is one of the worst states when it comes to the dollar amounts of fines and fees it imposes, said Foster, it’s also where some of the most significant reform efforts are taking place. People of color have consistently comprised more than half the participants at Legal Services Days in Multnomah County throughout the past year, said Thalia Sady, an attorney at Community Law. “It just reaffirms what we all know to be true – how our system has disproportionately affected people of color in our community,” she said. Alameda County, Calif., is considering an ordinance similar to San Francisco’s. Eliminating egregious criminal fines and fees isn’t solely a leftist ideal; some of the most conservative groups in the nation are also pushing for these reforms. The American Legislative Exchange Council (ALEC), Right on Crime and the Institute for Justice have all pushed for reforms around court fines and fees. In 2017, Texas passed a set of bills that require, among other reforms, that a defendant be assessed for ability to pay during or immediately after sentencing. If the defendant doesn’t have sufficient resources, the judge must delay payment, exchange the money owed for community service hours, or reduce or waive the fine. Since this law was enacted, warrants have decreased by 7 percent and the collection of fines has increased 6.4 percent, according to the National Center for State Courts. Foster said in West Palm Beach, Fla., court staff picks up the phone and calls people when their payments are past due. This along with enacting more reasonable pay structures has improved their collection rate. In Oregon, state statute directs that a judge “may” or “shall” consider a defendant’s ability to pay on most fines, but there is a big difference between those two directives and for many defendants, their fine amount can depend heavily on whose courtroom and in what jurisdiction they find themselves. Another factor in Oregon is funding. Lemman said his department has been having a conversation about funding with legislators throughout his 10-year tenure. “Ultimately they make most of the decisions that affect how we do our business,” he said. Since Legal Services Day began in Multnomah County in August 2017, about 600 people have been relieved of $2.9 million in debt to Multnomah County Circuit Court – a small fraction of the $474.3 million it’s owed. These legal clinics are projects of the Community Law Division at Metropolitan Public Defenders and the Multnomah County District Attorney’s Office. The Community Law Division was founded by public defender Alex Bassos and Aliza Kaplan, who teaches at Lewis & Clark Law School and serves as its Criminal Justice Reform Clinic director. “Community Law is the only organization in the area, in the state, whose whole mission is to remove the barriers downstream from the criminal justice system that keep people in poverty,” Kaplan said. While Legal Services Day has only been available to a limited number of people in Multnomah County, staff at Community Law are working to change that. They’ve set up an additional legal clinic in North Portland, with its first Legal Services Day scheduled for March 2019. There are also plans to extend its programs to Marion and Columbia counties. In the meantime, they’re looking at ways to change recruitment so that people aren’t camping out and waiting in long lines, hoping to get services. Community Law also serves about 20 people per month through Project Reset in Multnomah County and, since it started there in the spring, about three people per month in Clackamas County. To qualify for this legal services program, people must have a caseworker and a referral. Project Reset clients have frequently taken Community Law attorneys to various municipal and county courtrooms to ask judges to use their discretion and reduce or erase debts. Several people at Legal Services Day said that while they were relieved to have their debts in Multnomah County forgiven, they still owed money to Washington and Clackamas county or other municipal courts and jurisdictions. Dion, who asked we not use his full name, had felony convictions in both Multnomah and Washington counties. After getting his fines and additional fees forgiven, he must pay $80 to the Oregon State Police for a background check in each of these counties before his expungement can be approved. While attorneys at Legal Services Day can waive the $265 expungement filing fee, this $80 payment to state police is one of several expenses they cannot eliminate. When we met Dion at the legal clinic for military veterans in September, he told us he was unable to settle his legal matters all at once, and this was his third year in a row seeking legal relief services. One year earlier, a portion of his fines and fees was waived and he was able to expunge a 10-year-old marijuana conviction in Multnomah County. Unable to pay for both expungements at once, Dion still has to come up with the money he will need to expunge his conviction in Washington County. The father of four was injured during his tenure as a Navy fireman, dislocating his knee. The military doctor told him then it would be an issue for the rest of his life. “It’s hard to get work with felonies on your record that isn’t hard labor,” he said. Right now things are tight. He said he had to sacrifice paying his cellphone bill that month so he could buy his kids back-to-school clothes. In addition to his fines, Dion served a 15-month prison sentence. Kaplan said the court system doesn’t reflect the reality of low-income people’s lives. While people of means might have the ability to show up to a court date in the middle of the workweek and challenge their fine, it isn’t as simple for someone living in poverty. Since 1988, Multnomah County has collected 57 percent of the $1.2 billion in punitive fines and fees it’s imposed. And while 68 percent of violations, such as traffic tickets, have been paid to the county, just 40 percent of felony-related fines have been collected, including restitution, according to records requested from the Oregon Judicial Department. Some Oregon jurisdictions, including Multnomah County, have shown more leniency in the application of fines to low-income defendants in recent years. However, some punitive fines remain mandatory, and fees and surcharges have grown. Since 1988, the Oregon Judicial Department has collected $2.86 billion in fines, fees restitution and other financial obligations on 16.7 million cases. But it’s imposed $4.7 billion on 18.5 million cases. After writing off the $145 million in debt that’s expired, there’s $1.7 billion left in outstanding debt that’s still owed to the department. While 75 percent of violations, such as speeding tickets, are paid within 30 days, for those who miss the 30-day mark, additional fees and surcharges can escalate the balance owed rapidly. A speeding ticket can go from $165 to $390 in just 110 days. Multnomah County parking tickets double in 90 days, and a $39 ticket more than quadruples to $164 after 145 days. And it’s primarily low-income Oregonians who get tagged with these additional costs for failure to pay upfront. The Judicial Department only expects to collect about 15 percent of its $1.7 billion in outstanding debt. That’s because the older a debt becomes, the less likely the state will be able to collect it. After 20 years, it writes off criminal debt completely, unless restitution is owed, then it writes off the debt after 50 years. Of Oregon’s 13,500 inmates held in state Department of Corrections facilities, 76 percent have outstanding criminal debt totaling $163 million. Collecting these funds became easier this past legislative session when lawmakers approved Senate Bill 844, which allows the state to garnish unprotected funds from an inmate’s trust account. In other words, the state can take money the inmate’s friends and family put on his or her books for commissary items, phone calls, etc. The average monthly payment is projected to be $22. In Oregon, money owed on criminal fines – the fines imposed when a person is convicted of a misdemeanor or felony – is split between the state’s Criminal Fine Account and the state’s general fund. During the 2017-2019 biennium, $77 million is expected to go to the Criminal Fine Account, and $66.8 million to Oregon’s general fund. Criminal Fine Account dollars are dispersed to an array of public safety programs under different state departments, with the largest chunk – $32.7 million – going to police training. The Department of Justice will get $21 million, Judicial Department $9.5 million, and money will also go to pay for programs such as alcohol and drug prevention at Oregon Health Authority, a domestic violence fund at the Department of Human Services and programs and facilities for the Department of Corrections. Traffic tickets are allocated differently. First, the state takes $65 dollars off the top if the ticket was cited into a circuit court, such as in Multnomah County. The state takes $45 if the ticket was cited into a municipal or county justice court. Then the remaining dollars paid on the ticket after the state gets its cut are split between the law enforcement agency that issued the ticket and the government that runs the court it was cited into. For example, when Portland Police write traffic tickets, which are cited into Multnomah County Circuit Court, the funds that remain after the state takes its $65 are divided equally between the city of Portland and Multnomah County.